After the indulgence of the holiday season, New Year is a time when we’re encouraged to think about fitness. 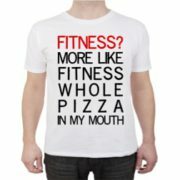 I recently encountered this meme: ‘Fitness? 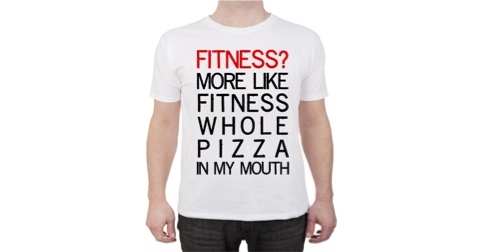 More like fitness whole pizza in my mouth’. There’s a lesson for non-native users of English here. So fitting may be pronounced fittin’. And after t, the ending may be further reduced, producing fit’n’. So fitting this can become fit’n’nis, which is very like fitness. I encourage non-natives not to pronounce -ing as ɪn, but rather to practise the ‘standard’ form ɪŋ. On the other hand, I think it’s worth trying out assimilated forms like in‿nis (for in this) and how’s‿zat (for how’s that) as a correction for over-pronouncing th, and to see how natives negotiate tricky word connections. It is not he that is being serious (or not). It is the retarded person that composed this ‘meme’ (which I fortunately haven’t seen anywhere else). Anyway, I would not have gotten it were it not for this explanation. I’m not sure if there’s any phonetic relevance to that.